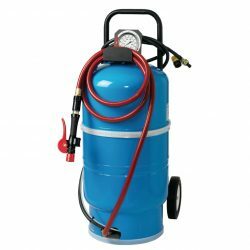 Conveniently supply water to forklift batteries anywhere in your facility with the 10 Gallon Mobile Bladder Tank (BTM-10). The BTM-10 stores water at the same pressure that it entered the tank. By using the water pressure of your building and not requiring any electrical power, the BTM offers a cost-effective water delivery method. The large handle and wheels make it easy to maneuver the unit around to fill battery cells as needed.